Image caption Progress at Ipswich Waterfront has fuelled a belief the town may be ready to become a city. 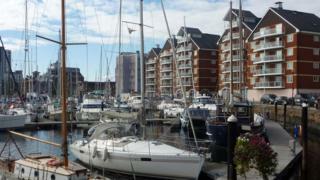 The Queen's platinum jubilee could be the springboard for a new bid for city status by Ipswich. Organisations have started making preparations in the hope that Buckingham Palace may offer the chance for bidding towns in 2022 or 2023. Led by Ipswich Vision, they believe becoming a city would boost the town's economy, confidence and credibility. As part of her diamond jubilee celebrations in 2012, the Queen chose three towns to become cities. Ipswich Vision chairman Terry Hunt said: "We are being a little bit presumptuous that it will happen, but we need to make sure we are ready. He added: "If you look at recent examples of towns which have become cities, they have led the way in economic prosperity, job creation and growth. "City status adds to a place's credibility - people seem more attracted to it than a town." He said the Turning Our Town Around campaign, linking Christchurch Park in the north with the Waterfront in the south, had been successful since 2015, and showed the town was "focused on where it's going". Image caption A long-awaited £3.6m revamp of Ipswich's Cornhill was completed in time for Christmas. The plan was announced on Wednesday as Ipswich Vision revealed its new set of priorities. It brings together bodies including the New Anglia LEP, Suffolk Chamber of Commerce, Ipswich Borough and Suffolk County Councils, Ipswich Central, the University of Suffolk and Ipswich MP Sandy Martin. In 2012, for her Diamond Jubilee, the Queen granted city status to Chelmsford in Essex, Perth in Scotland and St Asaph in north Wales. Chelmsford Business Improvement District said last year that its promotion to a city status had sparked "something of a renaissance, with large investments in retail spaces, offices and housing". Catherine Johnson, chair of Suffolk Chamber of Commerce in Greater Ipswich, said: "As a city, Ipswich would be in an even stronger position than at present to tell its story of dynamism and success to the world."